A large portion of the power that goes into a typical base loaded CB antenna is lost as heat in the coil and as dielectric heat loss in the plastic inside the coil form. Many CB antennas lose more than 50% of the power put into them. The power is wasted as heat loss and not radiated as radio waves. Another weak link in other CB antennas is the capacitor used to match the coax to the antenna, which is a cheap and easy way to make the SWR look good, but has lots of power loss, plus blows out when high power is applied to it. The second priority was to get rid of the resistive heat losses in the coil. Since most of the RF energy at 27 MHz travels on the surface of the wire, it was decided to increase the surface area by making the diameter of the wire larger 10 GA copper. Since silver is a much better conductor than copper, although very expensive, the wire was heavily silver plated. This reduced the resistive loss to a minimum. Finally, to get rid of the losses in the matching between the coax and the loading coil, the lossy capacitor was eliminated and a difficult but more efficient means of coupling the antenna was used. A Scalar Network Analyzer was used to determine the very precise point to direct match the coil with the coax and obtain the best match with maximum power transfer, which gives the 3000 watts of power handling capability. 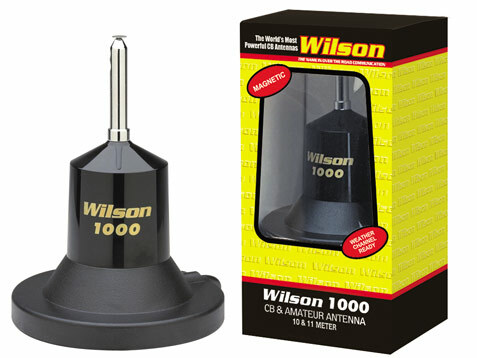 So far you have read about why the Wilson 1000 performs better, but the Wilson 1000 is also the most rugged antenna you can buy. It is made with Mobay’s Thermoplastic which costs a lot more, but it’s the best available. All of these are the reasons you get a 2-year guarantee . Total usually runs about $16-$18 depending where you live. *TEST RESULTS: In tests conducted by Lockheed Corporation, one of the world's largest Aerospace Companies, at their Rye Canyon Laboratory and Antenna Test Range, the Wilson 1000 was found to have 58% more power gain than the K-40 Electronics Company, K40 CB Antenna. This means that the Wilson 1000 gives you 58% more gain on both transmit and receive, on channel 40. Now you can instantly increase your operating range by installing a Wilson 1000. ANTENNA POWER GAIN : the amount of improvement in power amplification over another antenna. The higher gain antenna will transmit & receive farther, but the actual distance will vary depending on the gain, ground terrain and other environmental factors. Individual test results may vary due to the vehicle's ground plane and matching configuration.